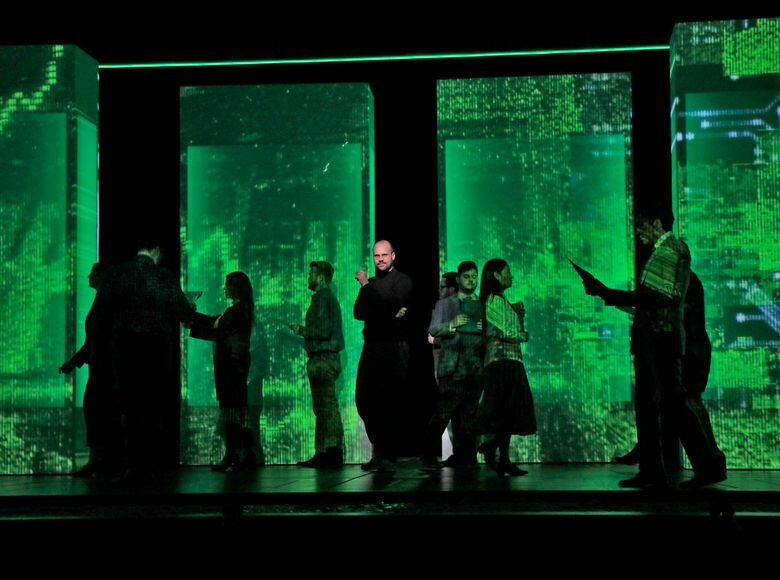 "The (R)evolution of Steve Jobs," a 90-minute, one-act opera that takes a nonlinear look at 18 scenes from the life of Jobs, makes its West Coast debut Saturday, Feb. 23, at Seattle Opera. As opera subjects go, Steve Jobs wasn’t everyone’s ideal, at first — not even that of the composer who came up with the idea. 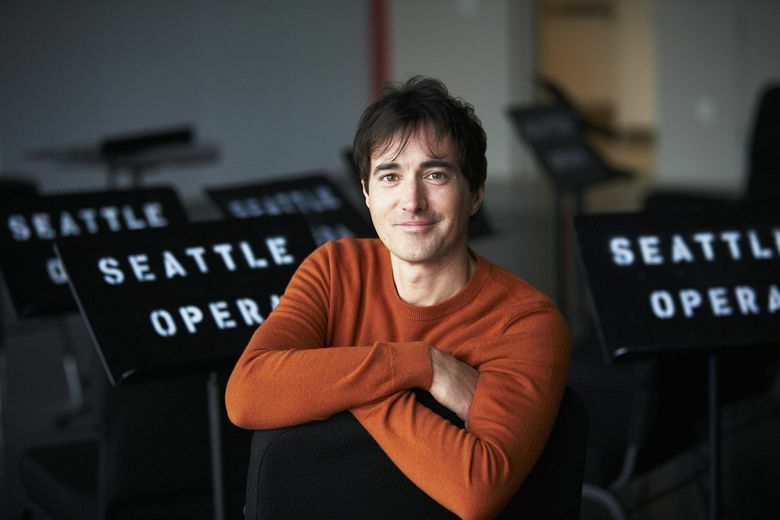 San Francisco-based composer and DJ Mason Bates was approached a few years ago about creating an opera. The result: “The (R)evolution of Steve Jobs,” a brisk, 90-minute, one-act opera that takes a nonlinear look at 18 scenes from the life of Jobs. It makes its West Coast debut Saturday, Feb. 23, at Seattle Opera, which last presented a newly commissioned opera on its mainstage nearly a decade ago. It comes bringing much buzz, fresh off a Grammy Award for best opera recording, and a 2017 run at Santa Fe Opera that met with standing ovations and high ticket demand. Perhaps more importantly, in terms of drawing people who’ve never attended an opera performance, it has name familiarity. Usually, in opera, that means the composer: Mozart, Puccini, Verdi. In this case, though, it’s the title subject, a man whose name reverberates not just in tech towns like Seattle and San Francisco. “Everybody is carrying a little bit of Steve Jobs in their pocket,” said Bates, 42, who was the first composer-in-residence at Kennedy Center for the Performing Arts in Washington, D.C., and who was named one of the most-performed living American composers by Musical America. Still, that familiarity bred some resistance. “Oh God, no,” Pulitzer Prize-winning librettist Mark Campbell remembers thinking when Bates first approached him to collaborate on an opera about Jobs. Bates was interested in telling both the story of our modern relationship with technology and also a timeless human story. “The real pivot in the piece is toward the human story,” he says: Jobs’ search for peace as he faces his imminent death and relives past memories (forming the 18 scenes that jump back-and-forth in time and place); his relationships with others; his desire to control everything in his life and his inability to control his death. Along the way, we meet other characters including Jobs’ wife, Laurene Powell Jobs; his spiritual adviser, Zen Buddhist priest Kōbun Chino Otogawa; and Apple co-founder Steve Wozniak. Each of the characters have their own specific “sound world”: quicksilver electronica and acoustic guitar for Jobs; a more primordial, oceanic sound for Powell Jobs; Tibetan singing bowls for Otogawa. 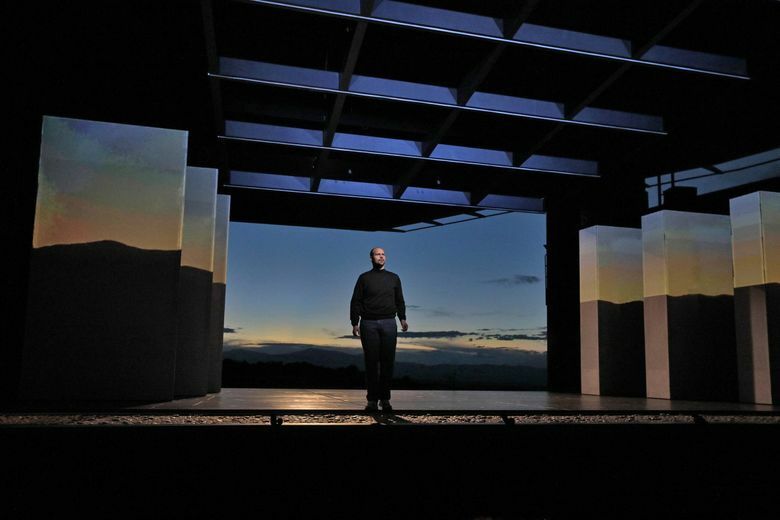 During the run of “The (R)evolution of Steve Jobs” in Santa Fe, the opera received mixed reviews from critics, some of whom called out the trope of a mercurial man being redeemed by the love of a good woman. The Powell Jobs character is more than just a support, Bates says. “You can see her being one of the people who can really push Steve.” Still, the piece is being revised for its Seattle Opera run, to make the character more independent. “The (R)evolution of Steve Jobs” is a calculated risk for Seattle Opera, which hasn’t mounted a new opera that it’s commissioned on the mainstage since 2010’s “Amelia.” (Its “An American Dream, a smaller-scale piece that was not part of the mainstage season, was presented in 2015 and 2017.) Seattle Opera, along with Santa Fe Opera and San Francisco Opera, co-commissioned the piece; the three organizations, along with The Indiana University Jacobs School of Music, are sharing the cost — and risk and reward — of coproducing it. Opera audiences tend to be traditional, favoring the classics that date back centuries. And “a lot of people go into new music with a fear,” said Aidan Lang, Seattle Opera’s general director. Certainly, the opera company is working hard to overcome that, with marketing material touting the Steve Jobs opera as “user friendly,” and outreach to the tech community. Seattle Opera partnered with GeekWire for a panel discussion earlier this month on “The Flawed Genius of Steve Jobs.” A second forum, titled “Tech has changed Seattle. Now what?,” conducted in partnership with KUOW, takes place March 2. Already, ticket sales for this production is running about 20 percent ahead of single-ticket sales for “Amelia,” according to Seattle Opera. And though the subscription base for the show is a little smaller than that for the more traditional “Il Trovatore,” the company’s most recent past show, most subscribers have the Steve Jobs opera as part of their package.